Jay Robinson and his English pointer, Abby, prepare to head into the woods on a hunt. 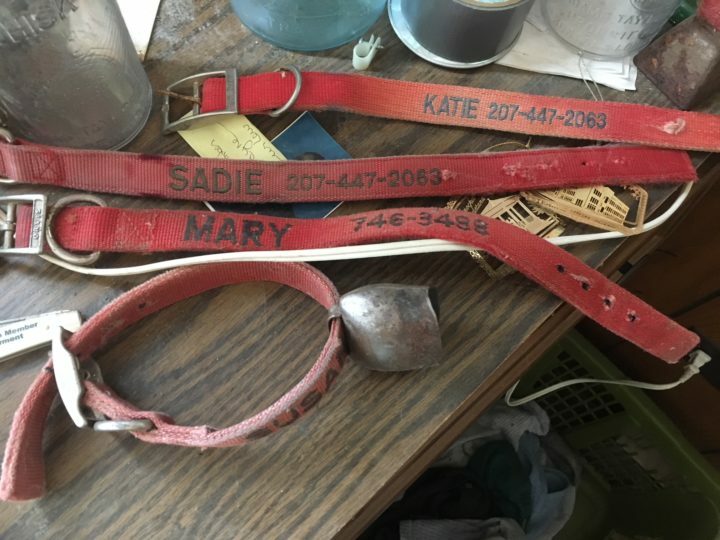 The well-worn collars sit in a corner of Jay Robinson’s Woodville home, each bearing the name of a loyal friend, gone too soon. Susan and Mary, Sadie and Katie. All of them top-notch English pointers. Each of them the subject of a hundred stories. All of them gone. Collars of bird dogs that he's owned sit in a position of honor in Jay Robinson's Woodville home. Come this time of year, when the leaves turn color and finally fall, Robinson spends a lot of time in the woods doing what he loves. He follows the gently tolling bell of the next pointer in search of a clean shot at a woodcock or a grouse. And later, he’ll fondly remember other days afield with his father, legendary Maine guide Wilmot “Wiggie” Robinson, or a regular client … or one of those fantastic dogs. Not so long ago, Robinson would keep two or three pointers in a kennel outside his home. Nowadays, he’s down to just a single dog — 9-year-old Abby — and admits that he has softened a bit in his expectations. No, there’s no outdoor kennel for Abby anymore. She’s an indoor dog and Robinson’s constant companion. And come October, she’s eager to prove that 11 months of relative leisure haven’t softened her a bit: She’s still a bird dog, through and through. 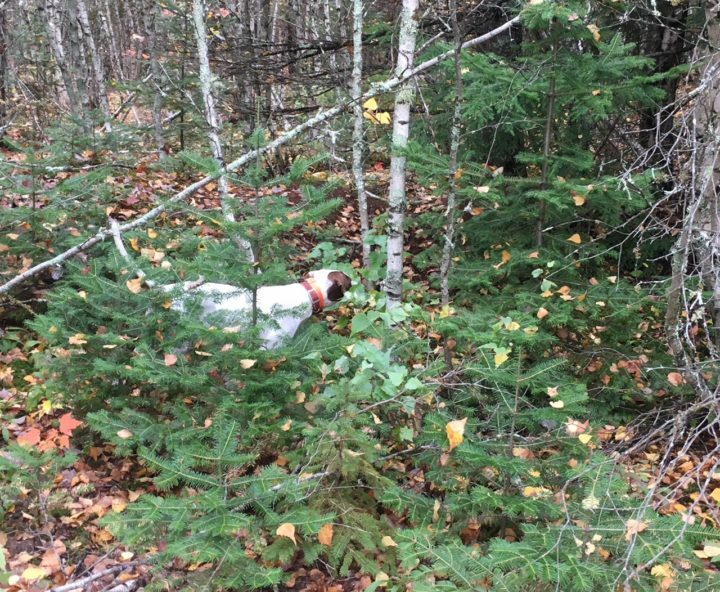 On a recent cool morning, Robinson welcomed me back to his familiar haunts, places in Millinocket and Woodville and Chester where he knows Abby will likely be able to sniff out a bird or four. We used to make a habit of these outings, heading out for a hunt every year or two. Then, as sometimes happens, the hunts became less frequent. One year off became three, then five, then nine. But there’s no better way to renew a friendship than to share a bird cover with an eager hunter and a fine dog, or to enjoy a sandwich between sessions in the woods. The years quickly melted away. Jay Robinson looks over a calendar from 2001 upon which he kept a diary of daily bird hunting activity. Robinson was a millworker, one of hundreds who faced a new reality when the paper mill in Millinocket shut down. 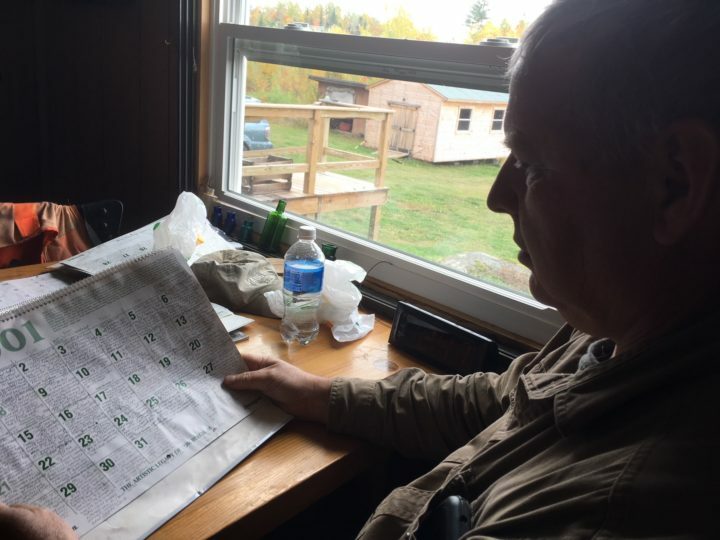 Sitting at dining room table, he looked at 25-year-old calendar pages that served as his diaries to times spent hunting during the month of October. Every day that wasn’t a Sunday seemed filled with details of yet another successful hunt. And according to those daily logs, nearly every time out was a day to remember. The totals signified how many birds the dogs found, not how many were shot. And that was during a time when he had three dogs with whom to split the action. Now, Abby is the lone dog, and he makes sure to give her time to rest. “You can’t go out as much. You don’t want to push the dog,” he said. And at the end of a day, he and Abby head back home, maybe spending a few hours watching the Red Sox on TV. “That’s the way to do it,” he said, admitting that a few short years ago, the idea of letting a bird dog sleep in the house was more foreign to him. Abby, Jay Robinson's 9-year-old English pointer, points a bird during a recent hunt. Nowadays, he treats his lone bird dog like a real part of the family. In fact, after Abby sustained a knee injury back in 2017, he took steps to make sure she would be comfortable around the house. There was no guarantee that Abby would be able to hunt after her ACL surgery, but she was recovered and ready to go by last October, just six months after she was injured. 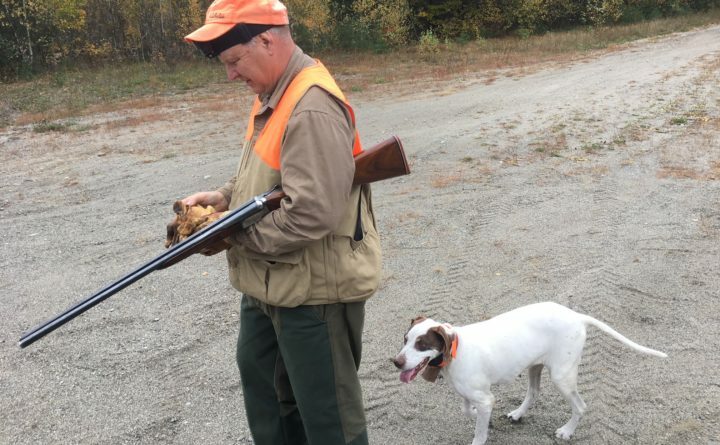 Robinson said he’s hoping to find another bird dog like the ones he has had before — always an English pointer, always a female — but for now, Abby is on her own. And on this day, she moved as fluidly as a pup, showing no sign of injury or age. Occasionally, Abby’s bell stopped ringing, signaling that she’d located a bird and gone on point. A few times, we even got off shots at birds after Robinson flushed them. After a few miles walked and many tales shared, we called it a day, agreeing that all things considered, it had been a success. And we promised to get back together for another hunt. “Let’s not wait so long this time,” Robinson said.